Sister Mary Xavier Kirby, S.S.J. 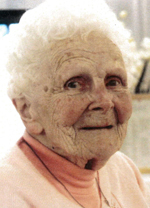 Sister Mary Xavier Kirby (Lucy Kirby), a Sister of St. Joseph and former president of Chestnut Hill College, Philadelphia, died Jan. 26, 2016 at age 98 in the 76th year of her religious life. She entered the Sisters of St. Joseph Sept. 10, 1940 and professed her final vows Aug. 11, 1948. Daughter of the late Alfred and Helen Kirby (nee Murphy), Sister Mary was born in Harrison, N.J., and attended Good Counsel Grade and High School. Sister Mary earned an A.B. degree from New Rochelle College and an M.A. from the Catholic University of America. Her service and dedication in the field of education for many years is noteworthy. She ministered in the Archdiocese of Philadelphia and the Dioceses of Baltimore and Camden in grade and high schools. She served as president of Chestnut Hill College, dean of the graduate division and faculty member at the college for many years. Sister Mary later continued her ministry as SSJ Development Office staff member and grant writer for the congregation. She volunteered at the Motherhouse until she became a resident of St. Joseph Villa on May 3, 2006. The funeral Mass was celebrated Feb. 2 at St. Joseph Villa. Sister Mary was the sister of the late Al (Marge) Kirby and the late Edward (Jane) Kirby. She is survived by many nieces and nephews: George Kirby (Joyce), Judith Kirby Lyman (Frank), Steve Kirby (Martha), Jim Kirby (Lynne), Denis Kirby (Cheryl), Peg Lucia (Jim), Lucy Burnelle (Bill), Kathy Griffin (Jack), Michael Kirby (Maryanne) and many, many great nieces and nephews. Donations in Sister Mary’s name may be sent to St. Joseph Villa, 110 West Wissahickon Avenue, Flourtown, PA 19031-1898.